our U.S. blog readers a wonderful celebration. and cherishing the old this Thanksgiving. Blessings to you all during this season of gratitude. a multitude of things to be grateful for. and I am VERY thankful to be home safely. Family tops the list on my grateful meter. We’ll return with a new post on Monday, December 1. See you then! I’m excited to be part of A Cup of Christmas Cheer this year! My story, “Secondhand Miracle,” is part of Volume Four: Heartwarming Tales of Christmas Present. The small town in “Secondhand Miracle” is loosely inspired by the historical Victorian town of Lewisburg, located in central Pennsylvania. Rugged retired sailor Henry Pearson is a man who welcomes a challenge. Little does he know that his Christmas agreement with his wife, Rose, will prove daunting. This year, hoping to simplify and focus on the true meaning of Christmas, they decide to limit their spending to only $20. Soon he begins to wonder if their agreement is impossible. How can he ever find the perfect meaningful gift? Just as he thinks all hope is lost, Henry uncovers a bit of Christmas magic in a secondhand shop. His heartwarming gift will be just the perfect treasure to remind Rose of the long legacy and beautiful love they’ve shared together. Not long ago my dad shared a sweet true story from early in his relationship with my mom. A young sailor passing through a train station near my mother’s college, they hoped for a fleeting glance before he was deployed. Standing on the back of the train as he passed through the busy Philadelphia train station, the two only caught a quick glimpse of one another before his train disappeared from the station. But just before it did, my dad reached in his pocket and tossed my mom a small gift. From the moment I heard how the touching scene unfolded, I knew it begged to be the seed of a bigger story, filled with the same heartwarming emotion and genuine time-enduring love. I hope my readers are blessed by the sweetness of an enduring love and a reminder that it’s the simple things at Christmas and in life that truly mean the most. Every year, my family enjoys making gingerbread houses out of graham crackers. We fill the kitchen table with assorted candies and “building supplies.” We listen to Christmas music while we craft our masterpieces. I welcome the wonderful time of togetherness it provides! Have you ever received a gift that how you received has its own special story? Why not share that memory with someone today and let the gift of joy you felt keep giving? Enter and you could win this beautiful “Love Richly” mug. Once there, follow the directions to enter. Drawing ends Nov. 30th. Congratulations to Caryl K., winner of the giveaway. Susan Call is an author and speaker whose passion is encouraging contagious hope and inspiring faith-filled strength to overcome life’s challenges. Susan’s memoir, A Search for Purple Cows, also published with Guidepost Books, shares her remarkable story of betrayal, finding faith, the power of forgiveness, and the joy of redemption. She has written for Guidepost Magazine, Chicken Soup for the Soul, and for Focus on the Family Magazine. Susan speaks fluent Swedish and enjoys pursuing a hobby of photography. She’s a proud mother of two children, a wife and a stepmother. Be sure to connect with Susan online by visiting her website at http://susancall.com. The Christmas season is fast approaching, bringing thoughts of gift giving to mind. There’s sure to be someone on your list who would enjoy A Cup of Christmas Cheer. to a blog reader who would like to gift the cute little books to a friend. If you’d like to win the books for your friend, enter our giveaway below. 1) Who would you choose to give the books to if you won the copies? 2) Why you would choose that particular person as your recipient? Deadline for the Give A Gift Giveaway is Nov. 30th. Winner will be announced in this post on Dec. 1st. the comment process, so we can contact you if you’re the winner. Kim Amundsen is the winner of the Give A Gift Giveaway! 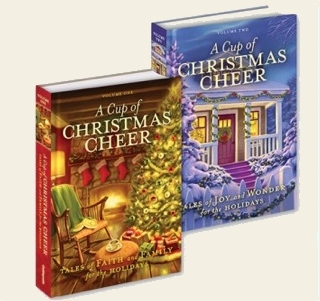 enjoying the stories in A Cup of Christmas Cheer.